The New Samsung Galaxy S5 is Out! Earn $10 Extra on $50+ Trade-Ins at Gazelle… Ends 4/30! The Samsung Galaxy S5 is rumored to be a fan favorite with a faster camera, amazing screen, better battery (not to mention the cool heart rate monitor and fingerprint scanner) and a clear contender for your pocket in 2014. Considering an upgrade? What will you do with your old phone? 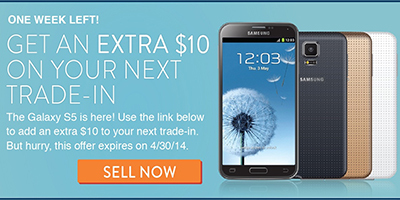 For only a few more days, Gazelle is giving an extra $10 on devices traded in valuing $50 or more. This deal comes at a perfect time since the latest upgrades scheduled for multiple smartphones (Galaxy S5, Sony Xperia Z2, LG G3, etc.) are hitting the market now. Gazelle offers trade-ins for everything from smartphones to laptops to tablets…. the list goes on, so go trade in something old and get some extra cash to buy something new. But you had better hurry, because this deal only lasts until April 30th! I love deals where you can trade in an old phone or device to make money to help buy a new device. Thanks for reminding me about gazelle. I saw it featured on a talk show awhile ago!